Mobile phone manufacturers seem to be on a continuous mission to outpace one another. With different mobile phone trends and brands coming out in the market every now and then, keeping on track with them can be difficult. 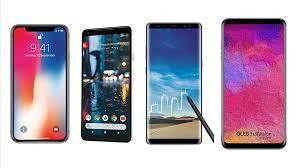 As we are confronted with a myriad of mobile phones, a simple task of buying a new phone can be pretty much daunting. Samsung Galaxy S9 is one smart phone choice. It features a fantastic visual screen display, improved RAM, longer battery life, improved speakers and a dual camera. If you want a camera that ensure bright images and will stay with full details even in poorly lit environments, Samsung Galaxy S9 will live up to your expectations. Although the most expensive iPhone series, it looks like it hasn’t failed its users with its gorgeous screen display, 3D mapping technology, improved dual cameras and overall impressive performance. OnePlus comes in a less intimidating price compared to its leading counterparts. But it sure comes with stunning performance that will easily be able to compete in the market now. It has a slick design, bright 6.3 inch OLED display and advanced Android version although its camera features may not be that particularly impressive. Google Pixel 2 exudes from the competition with its top-of-the-line Android performance featuring AI features and Google Assistant, outstanding camera, and ergonomic structure. And it doesn’t hurt to know that it is water resistant and has longer battery life. It may cost you quite a fortune though, but with ultra performing Smartphone in the box, you’ll get the optimum value for your money. Although, it still comes with LG’s not-so-impressive software, LG G7 Thin is worth your attention if only for its gorgeous display, bright LCD 16 mega pixels camera and fantastic sounding audio. This new Xperia series update has a lot to offer. Compared to its predecessors, it has better styling, faster performance and simple yet fully functional interfaces. Plus, you can’t go wrong with its excellent battery performance. If you are looking for a mid-priced phone with equally functional performance Moto X4 is a great option for you. If you don’t mind having to do with the lower 32GB memory, Moto X4 will impress you with its stylish design, great battery life, wide-angle camera and water-resistant feature. The first ever phone to introduce triple camera feature, Huawei P20 can tickle the fancy of every mobile users not only with its incredible tri-camera feature. It also has a stunning design, excellent battery, huge memory capacity of 128GB, and highly advanced processor. For a more affordable price, Nokia 6.1 offers a good-looking screen design, solid compact built, smart fingerprint scanner, capable 16mp camera and uncompromised durability and battery power performance. Xiaomi Mi A1 is Xiaomi’s fastest phone. It has a solid design, great features, long lasting battery and relatively great storage capacity that it can be considered a luxury considering its affordable price. Although photo and video quality is not that great, it’s essentially a phone that offers full functionality at a price that’s not as intimidating. Copyright © 2019 retrocell.ca. Powered by WordPress. Theme: Accelerate by ThemeGrill.